Polluted stormwater runoff is a big problem along our coast. That is why the North Carolina Coastal Federation is partnering with several coastal communities to try and reduce it. In the last year, the federation has secured more than $384,000 in grant funding from the Environmental Protection Agency Section 319 grant program, which provides funding to stormwater retrofits under Section 319 of the Clean Water Act, called the Non-point Source Management Program. Working with Wilmington, Wrightsville Beach, Swansboro and community partners, the federation will lead work to design and install projects to reduce the amount of polluted runoff entering surface waters. The first 319 grant the federation received in the last 12 months was for stormwater reduction projects in the Bradley and Hewletts Creeks watershed. The $107,000 grant will enable project partners to work with the City of Wilmington to install a series of at least 10 stormwater projects in the watershed. The federation, community partners and both state and federal agency representatives have focused on restoring water quality in the Bradley and Hewletts Creeks watershed since a watershed restoration plan was developed in 2007. The goal of the plan is to reduce the volume of stormwater runoff that is polluting waterways so that shellfishing and swimming waters can be restored. This fall, project partners are completing field audits to determine which specific sites will be selected for retrofit projects. Construction is set to begin in spring 2018. The federation has already completed projects as part of the Bradley and Hewletts Creeks watershed, including a series of projects along the John Nesbitt Loop in Wrightsville Beach. Click to enlarge. 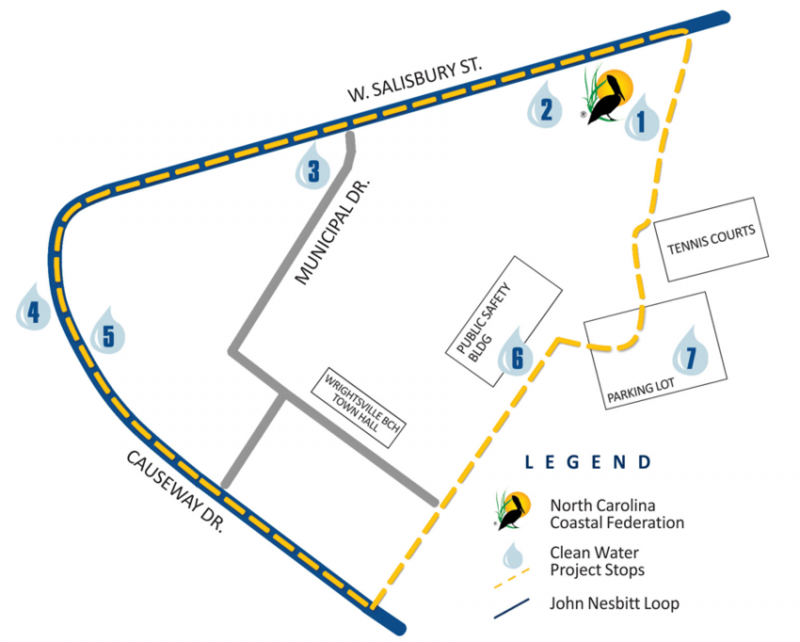 Several projects have already been installed in Wrightsville Beach and Wilmington, including ones along the John Nesbitt Loop, which are great demonstrations on how to reduce runoff and restore the Bradley and Hewletts Creeks Watershed. In Wilmington’s Shandy Point neighborhood, which is a low-density development located beside the Intracoastal Waterway, another $105,300 Section 319 grant will also help achieve goals outlined in the Bradley and Hewletts Creeks Watershed Restoration Plan. The project focuses on reducing bacteria in the creeks and their adjacent estuarine waters by installing an infiltration system to get stormwater into the ground. This retrofit project will reduce the volume of stormwater runoff by an estimated 80 percent, or 12,000 cubic feet, during a 4.6-inch rainfall. Finally, working in the central coastal region, the federation received a $172,397 Section 319 grant for targeted stormwater retrofits in Swansboro just months after the town voted to adopt their watershed restoration plan. The plan aims to reduce the town’s stormwater runoff to the 1993 levels of runoff, which are significantly lower. “The federation helped the town develop the plan and we are now thrilled to partner with them to begin implementation,” said Lauren Kolodij, deputy director with the federation. With this funding, the federation and Swansboro will work together to design a new public parking lot that will connect two municipal buildings with pervious pavement and other low-impact development techniques, reducing net stormwater runoff and preventing new runoff from entering the White Oak River. “The combination of permeable pavement, bioretention and cisterns will reduce an estimated 58,700 gallons of stormwater runoff that results from a typical rain event,” said Bree Tillett, coastal specialist for the federation. Stay updated on the federation’s work with this new funding at nccoast.org/stormwater.